i. A short editorial statement on policy issues – not more than two thousand words, placed not necessarily on the first page. iii. One or two review articles by invitation or on application. iv. Peer reviewed articles by invitation or on application. v. Letters to the editor. vi. News – about, and on, African health and related matters. i. Title, which should be short and specific. ii. Full names of all the authors, qualifications and affiliations of each, and full address of each author. (Qualifications of authors are only required for purposes of Editor’s use and not for publication). iii. Name and address of the corresponding author and his/her phone/fax numbers (home & office). iv. Sources of financial support, if any. v. Summary of not more than 200 words. Kofi-Tsekpo WM and Karekezi CW. Detectability and measurability of amoscanate in plasma by TLC and HPLC.Drugs under Experimental and Clinical Research. 1988; 14: 31-37. Watkins WM, Howells RE, Brandling-Bennet AD and Koech DK. In vitro susceptibility of Plasmodium falciparum isolates from Jilore, Kenya to antimalarial drugs. American Journal of Tropical Medicine and Hygiene. 1987; 37: 445-451. Ole Fijerskov, Firoze Manji and Vibeke Baellum, eds. Dental fluorosis – Handbook for health workers. Copenhagen: Munksgaard, 1988 p.
C. Citation of Chapters in books: Same as (B) above. D. References in the body of text should be in chronological order and identified by roman numerals in square brackets: e.g. Specific point mutations in ……… naturally resistant laboratory isolates of P. falciparum [4, 5]. E. Figures, figure legends and tables should be professionally done, and glossy print photographs in black and white prepared from them (the original art work is not required). The prints should be 75 x 100 mm (minimum) and 125 x 175 mm (maximum). This should possess all the elements of scientific communication as research papers, but without abstracts and subheadings and with not more than 500 words and 5 references. i. Three clear copies of the complete manuscript as specified above. Submission of the manuscript created using a word-processing programme on in PC format is encouraged. In this case the diskette (virus-free! ), should be accompanied by two hard copies of the manuscript. iii. Written permission from authors whose copyright material has been used in the manuscript. 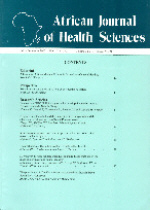 I/We…………… The undersigned, who is/are the author(s) of the manuscript titled………..transfer all copyright ownership of this manuscript to the African Journal of Health Sciences, in the event that the manuscript is published in the Journal. I/We give guarantee that the content of the manuscript is original, and is not currently being considered for publication by another Journal.